At Dreams Resorts and Spas, members can vacation in paradise. With resorts in Mexico, Panama, Puerto Rico and beyond, there is always an exciting destination to explore and timeshares make it possible for guests to experience history, culture and outdoor recreation in unparalleled style. 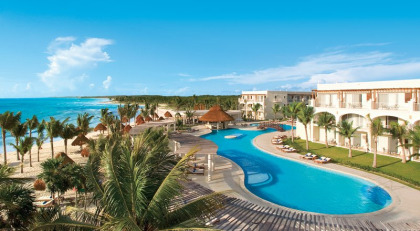 Dreams Resorts are located throughout Mexico and the Caribbean. Their collection is constantly expanding to capture new destinations. Best of all, guests are treated to the brand's Unlimited-Luxury package, which means that nearly all services and amenities can be included in an all-inclusive package. The company's strongest presence is in Mexico where it owns eight properties. Located in desirable destinations like Cabo San Lucas, Nuevo Vallarta, Cancun and more, guests who buy Mexico timeshares will be able to explore ancient ruins, sample exciting nightlife or just spend a few hours being lazy by the pool. Dreams Resorts also boasts four properties in the Dominican Republic, another in Costa Rica, two in Panama and one in Puerto Rico. Regardless of where they travel, guests will find superior amenities and accommodations. Local attractions and activities include snorkeling, scuba diving, trekking through rainforests, shopping, browsing through art galleries and much more. Most Dreams Resorts and Spas properties are located right on the beach, making it possible for guests to swim, surf and generally enjoy the laid-back, oceanside lifestyle. Guests have easy access to championship-style golf courses, and the pools at these resorts are cleverly designed and well-maintained. Clubs for children and teens make it easy for the whole family to enjoy their stay while the luxurious spas are certain to appeal to adults who are ready to relax. These Caribbean and Mexico timeshares boast excellent accommodations with generous square footage and plenty of high-tech touches. Furnished balconies and elegant bathrooms make these beautiful guest rooms functional and convenient. Suites with separate sleeping areas are widely available, and guests can expect modern decor mixed with a good amount of traditional artwork that is representative of the locale. At Dreams Resorts and Spas, guests enjoy all of the best that Mexico timeshares have to offer. From the finest destinations to outstanding accommodations, there are many reasons to choose this timeshare program and save money on the resale market for your next vacation. Contact Dreams Resorts and Spas Specialist Today!